اسلامی تبار, فرزانه, دبیری, روزبه. (1396). تاثیر جانمایی ژئوگرید در بهسازی خاک مخلوط ماسه- رس جهت استفاده در لایه های روسازی. فصلنامه علمی - پژوهشی مهندسی حمل و نقل, 9(ویژه نامه روسازی), 43-67. فرزانه اسلامی تبار; روزبه دبیری. "تاثیر جانمایی ژئوگرید در بهسازی خاک مخلوط ماسه- رس جهت استفاده در لایه های روسازی". فصلنامه علمی - پژوهشی مهندسی حمل و نقل, 9, ویژه نامه روسازی, 1396, 43-67. اسلامی تبار, فرزانه, دبیری, روزبه. (1396). 'تاثیر جانمایی ژئوگرید در بهسازی خاک مخلوط ماسه- رس جهت استفاده در لایه های روسازی', فصلنامه علمی - پژوهشی مهندسی حمل و نقل, 9(ویژه نامه روسازی), pp. 43-67. 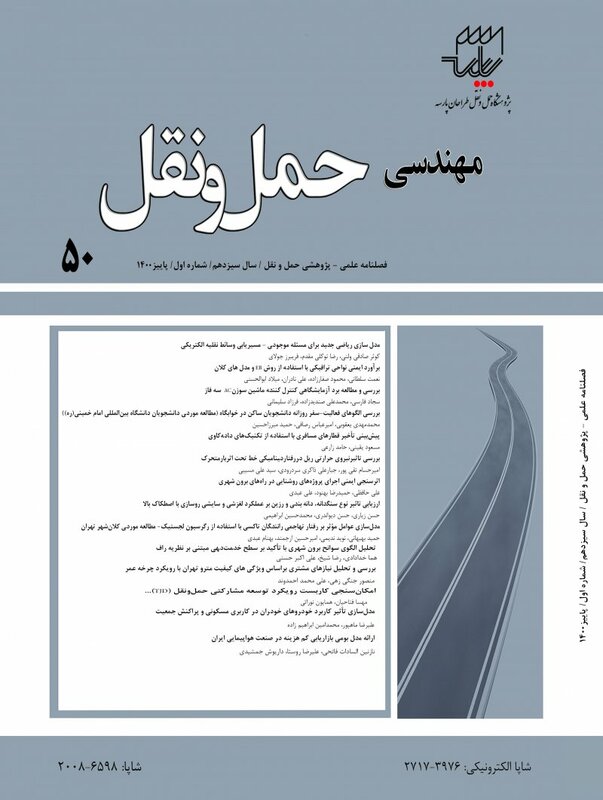 اسلامی تبار, فرزانه, دبیری, روزبه. تاثیر جانمایی ژئوگرید در بهسازی خاک مخلوط ماسه- رس جهت استفاده در لایه های روسازی. فصلنامه علمی - پژوهشی مهندسی حمل و نقل, 1396; 9(ویژه نامه روسازی): 43-67. تثبیت خاک روشی است که در راهسازی به منظور بهبود توانایی باربری مصالح بکار می‌رود. در حالت کلی، تثبیت خاک عبارت است از بهبود و اصلاح خواص فیزیکی مصالح برای تامین تعدادی اهداف از قبل تعیین شده هست. بهسازی خاکها در حالت کلی به دو صورت شیمیایی و مکانیکی انجام می‌شود. استفاده از مصالح ژئوسنتتیک جهت اصلاح خاک ها در دیوار حائل، خاکریزها، زهکشی بهره گرفته می‌شود. استفاده از ژئوگریدها در بسیاری از کاربردهای مهندسی و روسازی راه یک روش موثر در اصلاح خاک به شمار می‌آید. اضافه شدن رس یا سیلت به ماسه در درصدهای مختلف می‌تواند بطور اساسی رفتار ماتریس ماسه و رس را تغییر دهد. هدف اصلی از تحقیق حاضر، بررسی آزمایشگاهی تاثیر جانمایی لایه ژئوگرید و تعداد آن ها در میزان توانایی باربری و مقاومت برشی خاکهای ماسه ای و رسی منطقه باراندوز هست. در این مطالعه خاک ماسه‌ای مورد استفاده با خاک رسی با درصدهای (25، 50 و 75) مخلوط گردیده است. تاثیر ژئوگرید به دو صورت مطالعه گردید: مرحله اول یک لایه در قسمت میانی مصالح قرارداده شده و در مرحله دوم دو لایه در فاصله برابر از یکدیگر استفاده شده و تاثیر آنها در بهبود خصوصیات ژئوتکنیکی مورد بررسی قرار گرفت. جهت انجام تحقیق از آزمون‌های آزمایشگاهی نسبت باربری کالیفرنیا(CBR) و برش مستقیم در هر دو حالت خشک و اشباع براساس استاندارد ASTM بهره گرفته شده و میزان درصد تورم در خاک های ریزدانه اشباع اندازه ‌گیری شده است. نتایج حاصل از تحقیق نشان می‌دهد که حالت بهینه قرارگیری ژئوگرید، یک لایه و در قسمت میانی مصالح هست. زیرا این شرایط باعث بهبود میزان تراکم پذیری مصالح، افزایش میزان توانایی باربری با توجه به نتایج CBR، مقاومت برشی و کاهش میزان تورم در خاکهای اشباع حاوی ریزدانه می‌گردد. -ASTM D421-85 (1985) “Dry preparation of soil samples for particle-size analysis and determination of soil constants”, Annual book of ASTM standards, (reapproved 1998). -ASTM D422-63 (1963) “Standard test method for article-size analysis of soils”, Annual book of ASTM standards (reapproved 1998). -ASTM D 4318-95a (1995) “Standard test method for liquid limit, plastic limit and plasticity index for soils”, Annual book of ASTM standards. -ASTM D 854-02 (2002) “Standard test method for specific gravity of soil solids by water pycnometer”, Annual book of ASTM standards. -ASTM D 2419-02 (2002) “Standard test method for sand equivalent value of soils and fine aggregate”, Annual book of ASTM standards. -ASTM-D 698-00 (2000) “Standard test methods for laboratory compaction characteristics of soil using standard effort (12,400 ft-lbf/ft3 (600 kN-m/m3))”, Annual book of ASTM standards. -ASTM D1883-93, (1993) “Standard test method for CBR (California bearing ratio) of laboratory- compacted soils”, Annual book of ASTM standards. -ASTM-D 5321 (2005) “Standard testing method for determining the coefficient of soil and geosynthetic or geosynthetic and geosynthetic friction by the direct shear test method”, Annual book of ASTM standards. -Biswas, A., Kumar Dash, S. and Krishna A. M (2015) “Behavior of geogrid reinforced foundation systems supported on clay subgrades of different strength”, International Journal of Geosynthetic and Ground Engineering, Vol.1, No.20, pp. 9-11. -Dhule, S. B., Valunjkar, S. S., Sarkate, S. D. and Korrane, S. S. (2011) “Improvement of flexible pavement with use of geogrid”, Electronic Journal of Geotechnical Engineering, (EJGE), Vol.16, Bundle C, pp. 269-279. -Giroud, J. P. and Han, J (2004a) “Design method for geogrid reinforced unpaved roads. i. development of design method”, Journal of Geotechnical and Geo-environmental Engineering, ASCE, Vol.130, No.8, pp.775-786. -Giroud, J. P. and Han, J (2004b) “Design method for geogrid reinforced unpaved roads. ii. Calibration and application”, Journal of Geotechnical and Geoenvironmental Engineering, ASCE, Vol.130, No.8, pp.787-797. -GlasGrid-GC Datasheet, ADFORDS SAINT-GOBAIN Technical Fabrics (www.sgtf.com). -Kazi, M., Shukla, S. K. and Habibi, D. (2015a) “Effect of submergence on settlement and bearing capacity of surface strip footing on geotextile- reinforced sand bed”, International Journal of Geosynthetic and Ground Engineering, doi:10. 1007/s40891-014-0006-y. -Kazi M., Shukla, S. K. and Habibi, D. (2015b) “An improved method to increase the load-bearing capacity of strip footing resting on geotextile-reinforced sand bed”, Indian Geotechnical Journal, Vol.45, No.1, pp.98–109. - Kim, D. and Ha, S. (2014) “Effects of particle size on the shear behavior of coarse grained soils reinforced with geogrid”, Materials, Vol.7, pp. 963-979. -Kumar Senthil, P. and Rajkumar, R. (2012) “Effect of geotextile on CBR strength of unpaved road with soft subgrade”, Electronic Journal Of Geotechnical Engineering, (EJGE), Vol.17, Bundle J, pp.1355- 1363. -Latha, G. M. and Murthy, V. S. (2007) “Effects of reinforcement form on the behavior of geosynthetic reinforced sand”, Geotextiles and Geomembranes, Vol.25, No.1, pp.23-32. -Naeinie, S. A. and Mirzakhanlari, M. (2008) “The effect of geotextile and grading on the bearing ratio of granular soils”, Electronic Journal of Geotechnical Engineering (EJGE), Vol.13, Bundle J, pp. 1- 10. Naeinie, S. A. and Ziyaie Moayed, R. (2009) “Effect of plasticity index and reinforcement on the CBR value of soft clay”, International Journal of Civil Engineering, Vol. 7, No.2, pp.124-130. -Nazari, R. and Dabiri, R. (2016) “Comparison of geotextile layers effects on static and dynamic behavior of pavement”, Journal of Structural Engineering and Geotechniques, Vol. 6, No.2, pp. 15-22. -Oliver, T., Dobie, M. and Buckley, J. (2016) “Incorporating the benefits of mechanical stabilisation of unbound layers into a mechanistic-empirical analysis tool to improve permanent road performance”, In ARRB Conference, 27th, 2016, Melbourne, Victoria, Australia. -Raymond, G. and Ismail, I. (2003) “The effect of geogrid reinforcement on unbound aggregates”, Geotextile and Geomembranes, Vol.21, pp.355-380. -Sadeghi Azar, K. and Dabiri, R. (2015) “The effects of geotextile layers on bearing capacity of gravel-silt mixture”, Trakya University, Journal of Engineering Science, Vol.16, No.2, pp.61-69. -Thevanayagam, S. (2000) “Liquefaction potential and undrained fragility of silty soils”, Proc. 12th World Conference on Earthquake Engineering, Auckland, New Zealand, pp.8. -Williams, E. D. and Okine, N. A. (2008) “Effect of geogrid in granular base strength – An experimental investigation”, Construction and Building Materials, Vol. 22, pp.2180-2184.